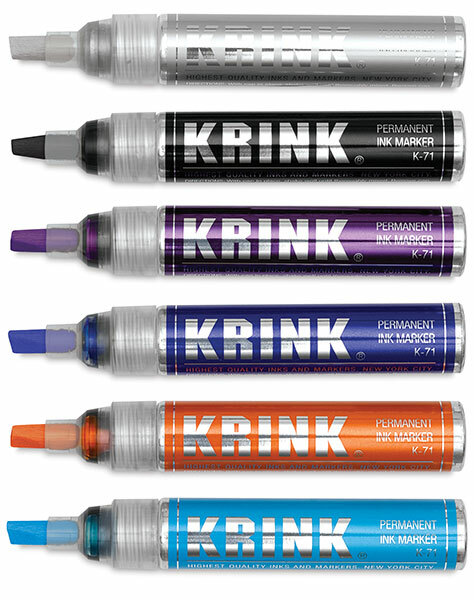 Krink K-71 Permanent Ink Markers feature high-quality dye-based inks in a variety of vibrant, translucent colors that are quick-drying and water-resistant. The durable broad chisel tip has two edges for creating different line widths. 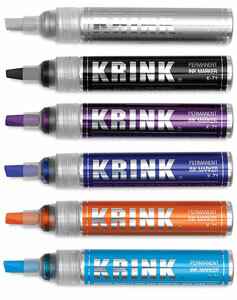 K-71 Markers write on most surfaces, including metal, canvas, painted surfaces, wood, glass, plastic, and paper. Their large ink capacity makes them great for art, craft, and industrial uses. The K-71's aluminum barrel is recyclable. Xylene-free. Handmade in the USA. Conforms to ASTM D-4236. K-75 Silver — The alcohol-based paint in this marker is permanent and opaque, with a 7 mm tip that is excellent for use on glass, metal, coated paper, and painted surfaces.